Win a Basket of Goodies at Mocksville Farmers Market this Wednesday! Wednesdays – Mocksville: Everyone loves to win! This week at the Mocksville Farmers Market, one lucky attendee is going to win a free picnic basket full of products from all 17 vendors! Products will include delicious fresh produce, delectable baked goods and delightful soaps. All attendees will receive a free raffle ticket and the drawing will be held at the end of the market. The Mocksville Farmers Market has been upgraded with wonderful and colorful awnings that provide cooling shade for farmers, customers… and produce. A misting station is available for extra cooling. 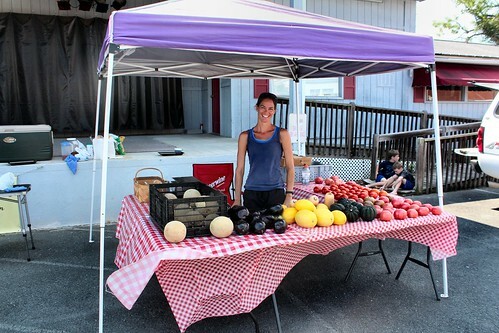 The Mocksville Farmers Market is open on Wednesdays from 3-6 PM in the Junker’s Mill parking lot at 107 Salisbury St.
Davie County Farmers Markets Every Wednesday, Friday & Saturday – Admission is free and the benefits are endless! Enjoy Davie County Farmers Markets each Wednesday, Friday and Saturday in the towns of Mocksville, Bermuda Run and Farmington according to the following schedule. The Mocksville Farmers Market is growing and adding new producers for even more fresh, healthy and local products. In addition to fresh produce, the market offers baked goods, candles, soaps, creams, lotions, farm art, honey, meats, pralines, berries, eggs, and more. In addition to produce, the Peachtree Farmers Market offers a variety of specialty items such as water buffalo cheese, seafood, meats, Moravian chicken pies, and handmade jewelry and pottery. Complete details can be found on the market’s Facebook page. The following producers are among those who attend the Peachtree Farmers Market each Friday. Each Thursday, the Peachtree Farmers Market posts an updated list of vendors attending the market that Friday. The Farmington Farmers Market is a family-friendly market that provides homegrown produce and goods. You will find seasonal produce, plants, honey & jams, fresh eggs, goat’s milk soaps & lotions, and fresh baked goodies. After you’ve visited the market, you may want to walk the walking track, play some tennis, do some bird watching or take a hike on the new Farmington Nature Trail, located behind the community center.